CEFSharp is a really great web browser control for WPF, and especially considering how few choices there are for a web browser in your project, it would be a shame if someone wanted to use it and could not. Not that it isn’t really easy, but it can be very frustrating when a seemingly simple thing turns into a three hour hair-pulling session because of…you don’t know what. Usually, when this happens, we turn to the web, looking for someone who has asked a question that is pertinent to whatever is blocking our progress, or perhaps demonstrated what we could not do. This post is for anyone who is having trouble getting started using CEFSharp in a WPF project…perhaps it will help someone. 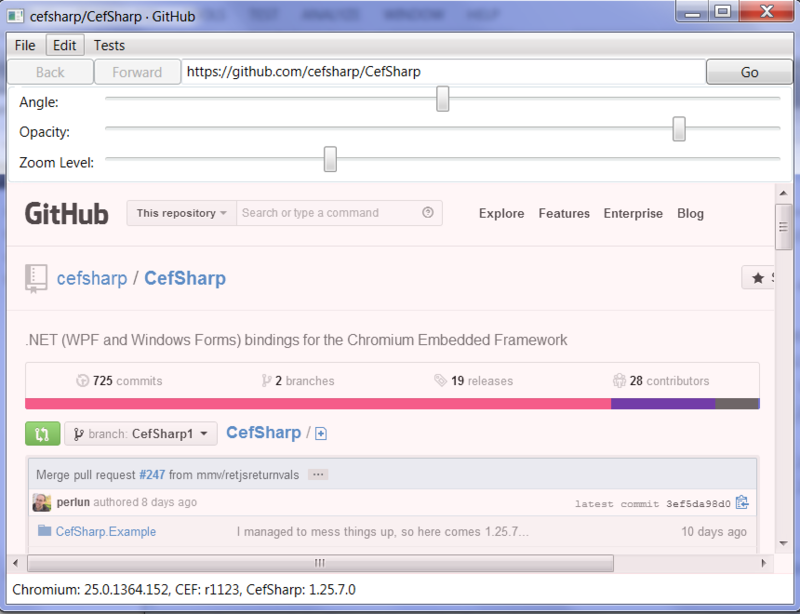 When at first I took the source of CEFSharp down from GitHub, copied it to my dev machine, it immediately built successfully. I had entirely missed out on having any red-squigglies to eat, and was totally robbed of any pretty little red build-error icons to trip over in my Error List panel. 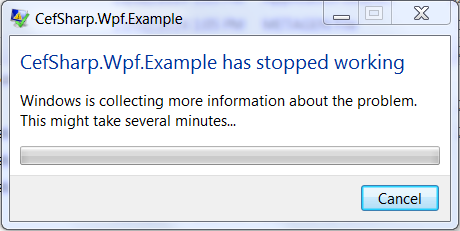 Thankfully, my sense of adventure, streaked with a wide stripe of cynycism, was finally rewarded with runtime errors when I ran the WPF sample! Phew! 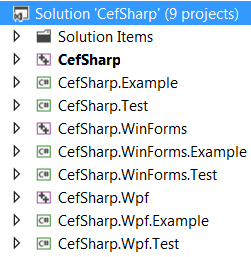 Here is exactly the steps I took to get started using CEFSharp.WPF in my project. First of all, I did try the binaries first, but when I encountered a runtime error, I went right back to GitHub to fetch the source, and went from there. Here’s what I got when I decompressed the source package from GitHub: Here’s what the solution looked like once opened: …and…Build Succeeded! Nice. 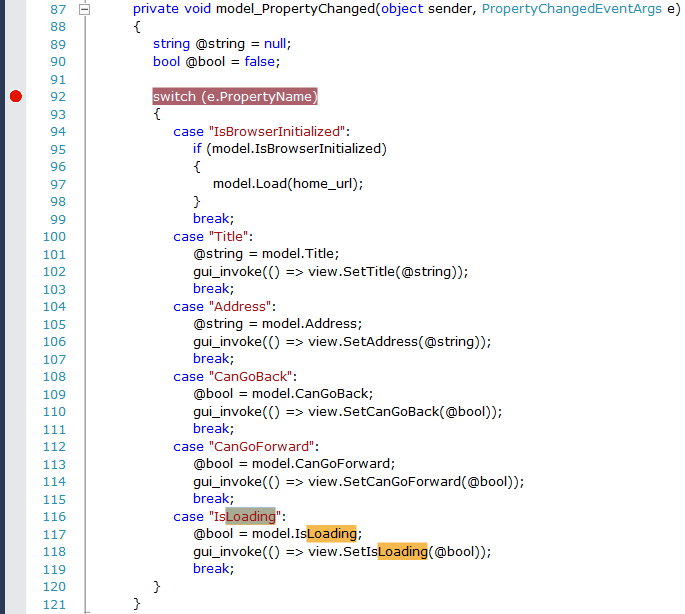 So after rebuilding the solution a few times and running the other projects in the solution only to receive the same message, I inspected the ‘bin’ folder of the built projects, and saw that in the case of the WPF example project, no debug directory was being created when I built the project! It was starting to look like a hair-pulling session was the order of the day. My next tactic was to combine the files from both the ‘Debug’ folder and the ‘Release’ folder. I created a new folder, copied the files from both debug and release folders into it, and then tried running the EXE again. Why did I do this you ask? Good question. Where did it get me? Success! So this gave me a clue: The solution was building everything to the ‘Debug’ folder in the root directory (which was unexpected), and for some reason, I needed to know that the files from the ‘Release’ folder, had to be copied to any directory where I wanted to run an EXE that uses CefSharp. That then, without wondering about it any further, is just what I did. I created a new WPF desktop application as a test, added direct references to the CefSharp & CefSharp.Wpf DLL’s, and then copied those files from the ‘Release’ directory to the ‘bin\debug\’ directory of the project, and that’s all that was needed to get things going. Incidentally, let me say this, first thing I noticed was: Per Lundberg’s WPF/C# code is impeccable! This switch statement was giving me the ‘hook’ I was looking for. I wanted to present a progress indicator whenever a page was loading, and for that I found I needed to ‘listen’ to the property: Loading. you can see it highlighted in the switch statement above. Now that I had this…I was unstoppable! A fast & furious coding/prototyping session followed, and soon I had the makings of a great wrapper of this great wrapper! Hopefully you’ve been able to glean enough intel from the post to get things going for yourself. If not, feel free to post a comment and ask a question, I’d be happy to try to help someone else out who is having trouble. Perhaps in a future post I will show a working example of my own with full source code for all to see. 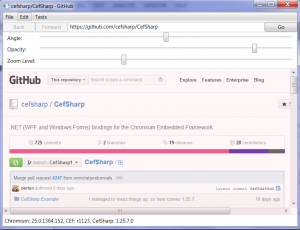 For now though, time to go back to playing with my favorite new toy: CefSharp! Thanks again Per Lunberg! I want to download a file with CEFSharp.. how can I do it? but only blank page is shown. If you copy all the dlls into debug folder next to App.exe then it works fine. 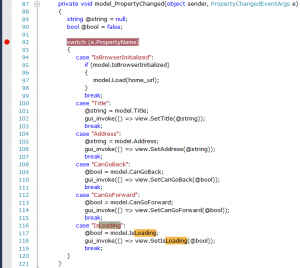 I am using CefSharp to replace the WebBrowser control in Visual Studio. The installation was a success. But I have two problems. 1 – I can not read a flash video in the browser, but Flash Player is installed. Now my program stops working when the video can not play. 2 – I have a textbox where you can enter a URL when I click on “Go”, web page loads well in the WebView but if I enter another web address (URL); the page does not load again. Can you help me to correct these problems?